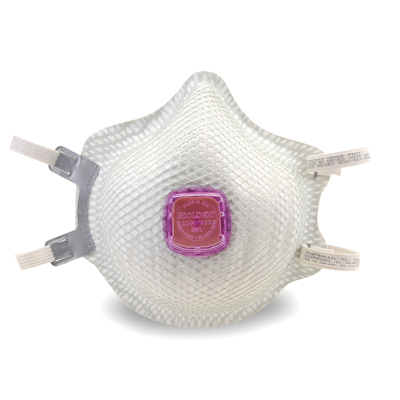 Masks are individually packaged to stay hygienic and clean until the moment they're needed. Ideal for first responders. Adjustable cloth straps allow for a more comfortable fit with a simple tug on the straps. Plus with the molded nose bridge there’s no metal noseband to adjust, and the seal is maintained without pressure points. Foam face cushion adds to overall comfort and the exclusive Ventex valve lets the hot air out faster so breathing resistance is reduced and workers stay cooler which means they won’t mind wearing it for an entire shift. 99.97% efficient against oil and non-oil based particulates. Use in environments where an OSHA substance specific standard applies (lead, cadmium, arsenic, MDA) as well as pharmaceutical manufacturing, conventional and nuclear power generation, welding, cutting and metal pouring. Environments where an OSHA substance specific standard applies (lead, cadmium, arsenic, MDA) as well as pharmaceutical manufacturing, conventional and nuclear power generation, welding, cutting and metal pouring. For oil and non-oil based particulates.